Renowned artist Joanne B Kaar takes inspiration from our heritage and her artwork is as much at home in museums as art galleries. Her interests include arts, crafts, heritage and fishing. She lives on Dunnet Head, only two miles from where she grew up in the village of Brough, where the harbour was her playground as a child. Listen to Joanne discuss some of the projects and extensive research that she has been involved in, particularly those with links to Caithness. She describes how she explored a connection between Caithness and Newfoundland when she became artist in residence for the Crafts Council of Newfoundland. This involved researching the folklore of wind knots and the selling of wind. Her interest in the sea led to using an ancient technique called needle binding, using fishing line to make hand protections, which incorporated contemporary art, ancient techniques, folklore and traditional design. 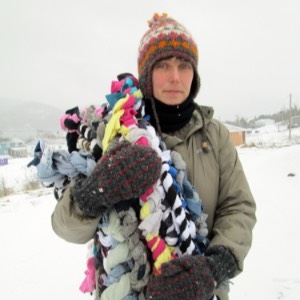 While on a residency to Iceland Joanne continued her interest in hand protections when she recreated two thumbed mittens, but chose to make them using barked twine, bought in Orkney. Listen to Joanne describe the re-creation of a traditional house move while she was in Newfoundland. This triggered the sharing of stories about traditional house moves across the ice, when people gathered together to participate in the simulation of the event. She also talks about a project called PORTable art, a Community Art project, which led to the stencilling of an oilskin jacket. This linked to the fishing industry and the klondykers. Another project called Fabric of Place, in Swaledale in Yorkshire involved the exploration of lichens. A contrast was made between the ‘lead loving lichens’ of Swaledale and the lichens of the North Coast around Dunnet Head. Lichens used as dyes continues to inspire Joanne’s artwork.